Most children are full of energy and naturally active, but many do not get the exercise they need. Too much time spent watching television or playing video games can deny children the exercise needed to strengthen bones and muscles and prevent them putting on weight. Recent studies have shown that inactive parents tend to have inactive children, whereas active parents have active children, so stay-at-home dads have a role to play by setting a good example. It is recommended that children get at least 60 minutes of physical activity every day. This can be in bursts of about 15 or 20 minutes throughout the day rather than all in one go. The exercise should be of moderate intensity and the child should be slightly sweaty and slightly out of breath, but not so out of breath that they cannot talk. Mention exercise to most adults and it will conjure up images of a gym workout on a treadmill or lifting weights, but for children exercise means playing and being physically active. Riding a bike or playing tag can be enough for a child to stay fit, but parental fears about safety mean many children are not allowed to stray far from home and are missing out on such activity. In fact, nearly 90 per cent of children fail to achieve even the minimum amount of physical activity recommended to avoid long-term health problems. Around eight million children in the UK fall short of the benchmark set by the government’s Department of Health for maintaining fitness levels and staving off diseases and problems ranging from heart disease to insomnia. Simply walking to school is an easy way to introduce exercise to a child’s daily routine. Walking is a low-impact and low-stress activity and will help a child develop a good posture, firm and tone muscles, burn off any stored up body fat, develop strong bone growth, reduce the risk of heart disease, be more physically and mentally alert, feel more confident and increase self-esteem. The fresh air and exercise will mean the child is more alert in class and another bonus is that walking is free. It could even save money by reducing transport costs. Children must always be supervised when out walking so it is an ideal opportunity for dads to join in - and at the same time make sure the child understands and follows the green cross code. Swimming is not only a good all-round aerobic exercise, it is also a valuable life skill. It puts little stress on the body and works all the major muscles. 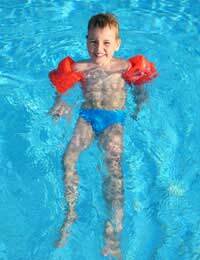 Children should learn to swim for safety reasons anyway, and once proficient can have fun in the pool and go at their own pace. Team sports such as football, rugby and basketball can be a fun way for children to stay fit, and organised events can often be found at community sports centres or schools. Dance and martial arts are alternatives for children who are not keen on team sports.